Prednisone and prednisolone are glucocorticoids which reduce inflammation and inhibit immune system responses. They are several times stronger than the stress hormone “cortisol” which is produced naturally in a dog’s adrenal glands and are often used for treating Addison’s disease in which your dog’s glands do not produce enough cortisol on their own. Because they suppress the immune system they are also effective in the treatment of allergies and are sometimes used as a follow-up to epinephrine when dogs have suffered anphylactic shock (a very severe allergic reaction). In terms of antiinflammatory effects, prednisolone is 4x more potent than hydrocortisone. It is not to be confused with methylprednisolone, which is a slightly more powerful variant of the drug. What’s the difference between prednisone and prednisolone? Prednisone is actually a “precursor” to prednisolone. 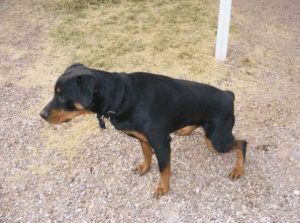 This means that once your dog takes prednisone it is converted by the liver into prednisolone. For this reason, vets often choose to give prednisolone to dogs who have poor liver function to avoid the need for conversion. Prednisolone is also the best choice when your dog can’t take medicine by mouth as it is effective when given as an injection or even when applied topically onto the skin. Immune Strengthener is a natural supplement for dogs containing vital minerals, vitamins and antioxidants. It is very effective for improving the health and prolonging the lifespan of dogs with Addison’s disease and lymphoma (cancer), giving you many more happy days with your dog. It also helps to keep allergies at bay, which can reduce itching in dogs with allergic skin conditions. Note: These recommendations should only be used as a guideline, your dog’s treatment should be carefully monitored and controlled by a professional. Never give this medicine to your dog without first consulting your vet for a dosage and treatment plan. When you first begin treating dogs with adrenal insufficiency (e.g. Addison’s disease) a dosage of 0.05 – 0.18 mg/lb can be given by mouth once daily until the condition is under control. Once the condition is under control your vet will slowly reduce the dosage until a “maintenance level” is reached, which is the smallest amount of medicine your dog needs to keep their symptoms under control. In some cases as little as 0.009 mg/lb is enough for maintenance but ultimately the correct maintenance dose is individual to each dog. When treating dogs with allergies a starting dose of around 0.25 mg/lb each day can be used. If relief is not achieved this can be increased gradually up to a total daily dose of 1 mg/lb spread evenly throughout the day. The objective of treatment is to find the lowest amount of medicine which relieves your dog’s symptoms (the “maintenance dose”). Once maintenance is reached you may be able to give the medicine to your dog every other day instead of every day which allows their adrenal glands to keep functioning. The table below contains information for treating other conditions. Canine Lymphomas * Prednisone can be used for adjunctive therapy at 50 mg/m2 by mouth every day for 7 days, then 25 mg/m2 every other day. Hypoadrenal crisis Prednisolone sodium succinate can be injected at a dose of 1.82 – 9 mg/lb over a period of 2 to 4 minutes. May be repeated after 2 to 6 hours. 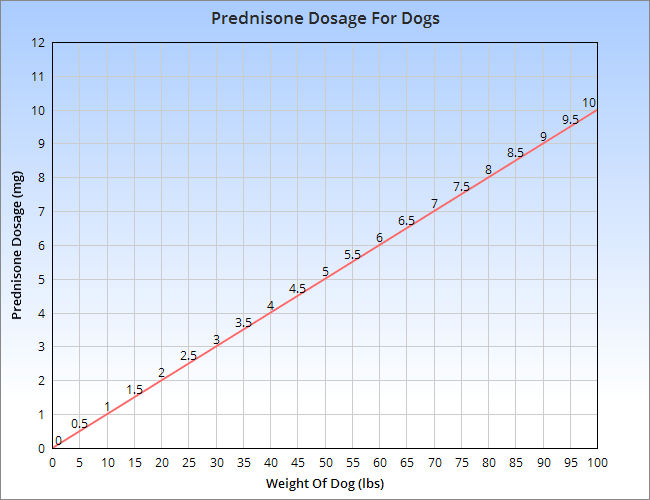 White Dog Shaker Syndrome Prednisone can be used for adjunctive therapy at 0.11 mg/lb every 12 hours for 10 days, then once daily for 10 days, then once every other day for a further 10 days. * Be careful when treating cancer, this drug can cause MDR (Multidrug Resistance) which reduces the effectiveness of chemotherapy. When treating coughing and itching conditions you should ask the vet about Temaril-P, a medicine which contains both prednisolone and trimeprazine. This combination can lower the required amount of corticosteroid. Important: Stopping treatment suddenly after long periods of use could cause Addison’s disease or serious heart problems. For this reason you should always taper the dosage off gradually. Not all dogs are suitable for treatment with this medicine. Some of the common side effects can be uncomfortable, and it is known to cause abortion when given to pregnant pets (which is also the case with other glucocorticoids). It should not be given to any dogs under 6 months of age as the immunosuppressant properties could be damaging. When dogs receive large amounts of glucocorticoid for long periods of time their body responds by shutting down its own natural production, due to a process known as negative feedback. If this happens the adrenal glands will atrophy and the dog’s body will then struggle to produce hormones even after you stop treatment. This is why it’s best to use an every-other-day dosing schedule whenever possible. After longer-term treatment it’s very important that you slowly wean your dog off of the drug instead of stopping suddenly. Stopping treatment suddenly could lead to Addison’s disease. They are considered useful in the treatment of shock due to the ability of steroids to improve circulation. Call the vet immediately if you notice any of these signs. * This is due to the suppression of the dog’s immune system. Vomiting and diarrhea may signal that the dosage used is too high, whereas serious heart problems are most often caused by sudden withdrawal of the medication after long-term use. If your pet develops any symptoms which you are unsure about make a quick call to the vet. 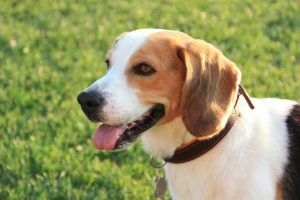 Severe reactions to the drug require immediate veterinary care. Signs of overdose from corticosteroids such as prednisone may include itching, seizures, loss of hearing, weakness, anxiety, depression and high blood pressure. In some cases heart abnormalities may be present. If you suspect an overdose seek veterinary care straight away. You can reach the ASPCA poison control helpline on (888) 426-4435.